Tuchel’s men began with an interesting positional structure. 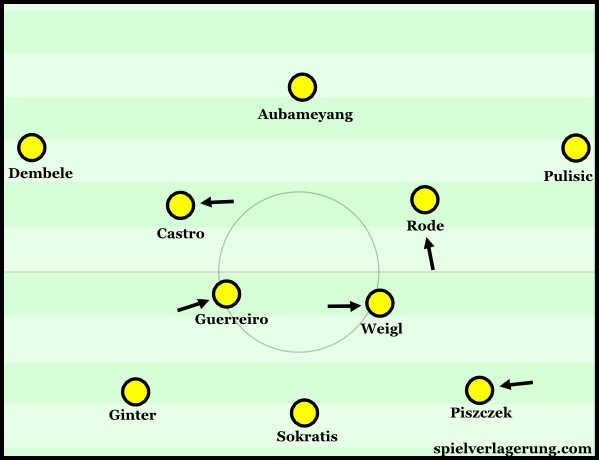 Operating in a 3-2-2-3 (or W-M) shape the double pivot was created through Guerreiro’s false full back movements as he moved to a position alongside Weigl. On the other side Piszczek moved infield a few metres to act alongside the centre backs and form a back 3. By removing his full backs from deep and wide positions Tuchel aimed to force his side to access the midfield quicker. This was particularly important to avoid the aggressive touchline pressing of their opponents. Furthermore the advanced positioning of the wide players; Dembele and Pulisic, may have been an attempt to prevent the home side from using their full backs in advanced pressing situations as they so often do. From their usual 4-2-2-2 shape Leverkusen put in an excellent display of collective midfield pressing, and much of their solidity was due to excellent defensive work from the front two. 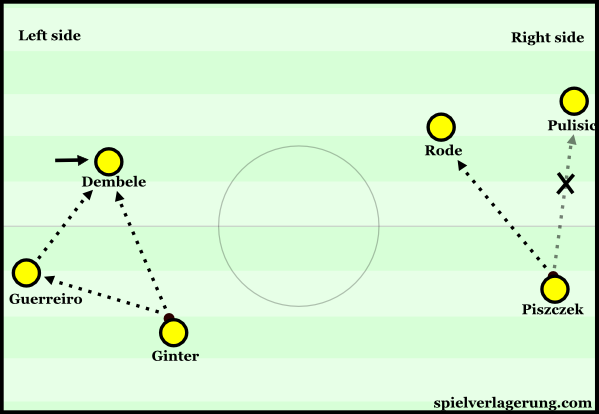 Schmidt’s side did not actively press Dortmund’s back 3 often leaving them free to circulate the ball amongst them. However they used their cover shadows consistently well and were almost always in the passing lane between the ball and the respective Dortmund midfielder behind them. As so often, two things triggered the most intense periods of pressure from Schmidt’s side; passes into their defensive block and passes into wide areas. On the occasions that Dortmund managed to breach the front line with passes, Bayer would pair strong backwards pressure from the front pair with aggressive pressing movements from the midfielders. This made it extremely difficult for Dortmund to access the midfield, and on the occasions they managed to it; it was almost impossible to progress cleanly from there with Leverkusen’s intensity leading to a number of regains. Furthermore if Weigl or Guerreiro were to receive the ball they would have to move away from the cover shadows of their opponents which could create further issues. By moving into deeper positions to receive the ball, Weigl and Guerreiro would lose connections to the players ahead of them which would make their movements redundant anyway. Furthermore receiving the ball on the move could make them more susceptible to the press of the Leverkusen midfielders. With a backwards facing field of vision being a natural pressing trigger, dropping movements from the Dortmund midfielders would invite pressure from Hernandez and Mehmedi. When the ball was with Dortmund’s side backs Leverkusen’s ball-near 10 would join the front line whilst covering the passing lane to Dortmund’s winger. This was predominantly done on the left side with Calhanoglu moving up whereas on the right side Brandt usually stayed deeper whilst Mehmedi shifted across. These Leverkusen dynamics had an adverse effect on Tuchel’s initial strategy. Firstly they struggled to access the midfield and were thus made to find the first passing route to the flanks which were the wingers. In addition to the strong compactness and intensity against the ball from Schmidt’s side, Dortmund clearly lacked passing quality from the back. None of Piszczek, Sokratis and Ginter are renowned for their passing ability and Dortmund missed the laser passing quality that Bartra could have brought. With able passers in the first line Dortmund would be capable of exploiting any lapses in the positioning of Leverkusen’s forwards. Furthermore due to the cover shadows of Calhanoglu and Mehmedi; Dortmund’s wingers had to move deeper and deeper to receive the ball. Receiving the ball with this negative dynamic was also counterproductive as it encouraged Leverkusen’s full-backs forwards to press. Immediately after Leverkusen’s opener Tuchel switched to a 2-3-2-3 with the ball, with Guerreiro and Piszczek now occupying more conventional full back positions. 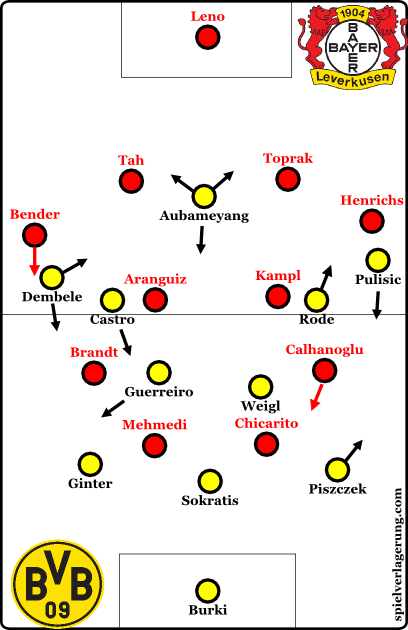 Later on this included 2-4-3-1 permutations as Castro moved deeper alongside Weigl and Dembele acted more permanently in the half space. However the game rhythm was not greatly altered with BVB still spending large periods circulating the ball across their back line. Still unable to access the midfield, the away side began increasingly focusing on the wings for breakthroughs. They would now circulate the ball across the whole back four to draw their opponents in to one flank before playing all the way back across and attempting to break through the ball-near half space. On the left this was usually done with the infield movement of Dembele, with the height and width of Guerreiro reducing Bender’s ability to track Dembele’s movement and the young Frenchman often advancing into the midfield with his dribbles. On the right however Pulisic and Piszczek’s positioning was more maladaptive as they both continued to occupy the flank leading to a weak connection between them. This meant they relied on Rode to break through the half space on the right and he was usually subject to Kampl’s coverage which made it difficult. However they did begin to establish a greater territorial advantage which was partly due to their effective counterpressing. Of course attempting quick combinations in the half spaces was inconsistent against the intense midfield pressing of Leverkusen, but when their combinations did not come off they were often able to win the ball back quickly with strong counterpressing. Immediately after the interval Dortmund brought Mor on for Pulisic and Schmelzer on for Castro. Whilst the Mor substitution was very much like for like, the Schmelzer substitution meant Guerreiro moved infield to a midfield position. Theoretically Mor could use his direct dribbling ability to aid their wing progressions, whilst Guerreiro could add press resistance in midfield. Much of the 2nd half continued in a similar fashion to the first, however Dortmund were increasingly able to access midfield areas for a couple of reasons. Firstly the space behind Leverkusen’s front line was increasing and Weigl could receive the ball in this space now without the furious backwards pressing that met him in the first half. The other reason was the role of Raphael Guerreiro in midfield, from his nominal left side 8 position Guerreiro often dropped into deep positions in the half space on either flank. With the ball-near full-back moving into an advanced wing position and the winger into the half space they created triangle structures on the wings which allowed them to outnumber their opponents. 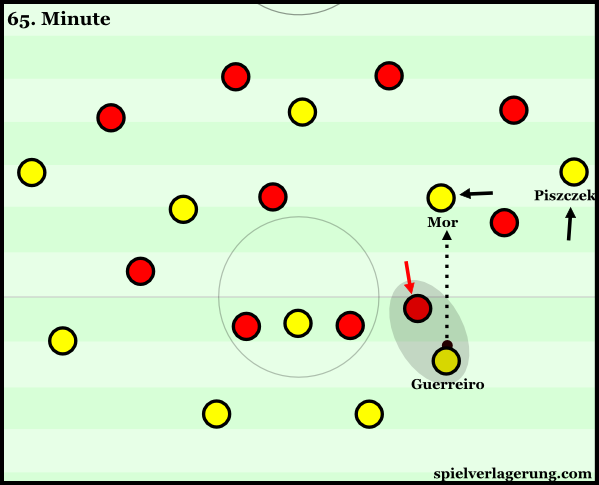 On some occasions Guerreiro was followed by Leverkusen’s man-oriented midfielders, however this increased the space for Dembele or Mor to receive the ball in the half space. However they were unable to translate these penetrations into chances and this was partly due to strong collective work from the Leverkusen players. In response to any passes into their block they would often collapse on the ball to force it out of dangerous areas and regain their positions. Furthermore they were unable to sustain pressure on the Leverkusen defence with attacks being separated by counter attacks and fouls from their opponents who at times put in over-zealous challenges. With Dortmund increasingly desperate in their search for an equaliser they began to lose the stability in defensive transitions that they had earlier and Leverkusen’s errors in passing execution were to blame for them wasting several chances to increase their lead. It was no surprise however when Leverkusen made it 2-0 on a counter attack with Calhanoglu and Volland combining on the left before the former squared the ball for Hernandez to tap in. A comprehensive victory, based on their excellent midfield pressing moved the home side up to 6th position in the league. After an indifferent start the faithfuls will now be hoping this can kick start a surge up the table for Schmidt’s side as they juggle domestic and Champions League football once again. As for Dortmund they will be disappointed with the result and their performance as they missed the chance to move to within one point of the leaders Bayern Munich. It was certainly a tough run of fixtures and it is possible they suffered the effects of their exertions against Real Madrid in midweek.